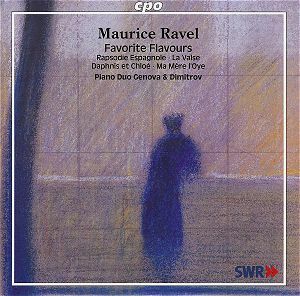 I thought that there was little more to be said about Ravel’s piano music (whether solo, duet or two pianos) when along comes this superb disk filled with interpretations and playing of such intelligence that I learnt new things about works which I was convinced were simply becoming war-horses. Rapsodie espagnole gets the disk off to a fine start. In the first movement the Duo perfectly captures the feeling of an hot and humid summer night, playing with a muted sound, as if in the distance. The succeeding Malagueña is fleet of foot and the well known Habanera, sensual and sultry. Up to this point, the Duo has, if anything, slightly underplayed everything, but never to the detriment of the music, and they finally let go in the rip-roaring Feria which ends the piece. This is extrovert holiday music, full of colour and gaiety, with a siesta for a middle section, and the pianists make every note tell as part of the festivities. If this wasn’t sufficiently exhilarating for you, the performance of La Valse, which follows it, has more than enough excitement to fill a boxed set! I’ve always seen this piece as being rather macabre, dark and full of foreboding – the end of the empire and the comfortable old order. Certainly the music crashes through tradition as it progresses from quiet rumblings to fantastic, out of control, barbarity. As with the Rapsodie, the Duo is alert to the muted quality of some of the music and in the more lyrical passages they display a suavity and style which is perfect for the dance. The final race to the finish is horrifying, as Ravel screws up the tension and all hell breaks loose; the penultimate bar, with its four beats brutally tearing across the constant pulse of three, truly feels like the end of everything. It’s easy to see why Diaghilev refused to stage the piece with his Ballets Russes, for to convey the amount of desperation Ravel displays would have been anathema to him. What a fantastic performance! After this barnstorming music, and music-making, we are taken into the childlike world of Ma mère l’Oye (or One in the Eye for Mother, as my master at college insisted on calling the piece). Theses miniatures are beautifully conceived for a piano duet, full of colour and childlike innocence, the various characters perfectly drawn. Although originally written for piano duet Ma mère is probably better known in its orchestral arrangement. However anyone approaching this version for the first time will not be disappointed for this Duo give a straightforward performance, showing a light touch and allowing the music to speak for itself and display all its virtues. Especially gorgeous here is the final Le jardin féerique (The Fairy Garden) which builds from the most tender and sublime music, with playing to match, to a big and happy-ever-after climax. The first two works recorded here were originally conceived for orchestra with the piano versions being made simultaneously. Ma mère l’Oye was written for piano duet and orchestrated slightly later. At no time, whilst listening, did I feel the lack of orchestral colour or the range of a full orchestral palette. With the arrangement of the 2nd Suite from Daphnis et Chloë which closes this disk I really did miss the orchestral sound. For many, Daphnis et Chloë is Ravel’s masterpiece and the 2nd Suite the most satisfying and enjoyable section. It’s easy to see why this excerpt – the last quarter hour of music from the complete hour long ballet – has become so popular by itself for it has everything; perhaps the most beautiful and fulfilling evocation of daybreak ever described in music, a ravishing, and sensuous, central movement, with plenty of evocative music for the solo flute, ending with a wild bacchanale. This arrangement, by Léon Roques, who made other arrangements of Ravel’s music (including a fantasia for four hands on L’heure espagnole), is good but you do miss the orchestra. The poor pianists are unable to get their mere twenty fingers and thumbs round all the notes in the final section and thus the tempo is slower than it should be, but this is not their fault. I am sure that this was not an arrangement made for home consumption, unless Horowitz was married to Richter! I can fully see the point of recording this arrangement – who has ever heard it, I wonder? – but there are other pieces which deserve our attention much more. I’d love to hear these two fine pianists playing Ravel’s transcription of Debussy’s Nocturnes for instance. But don’t be put off by this slight reservation - this is fantastic pianism. The recorded sound is very good, if a bit low cut, you need to turn up the volume to get the full presence of the performances and then they really come alive in front of you. The dynamic range is excellent, very wide and easily accommodates the loudest music whilst the quietest moments are very quiet indeed. The booklet notes, in German, English and French are full, detailed and informative. A most definite must-have. You won’t be disappointed.